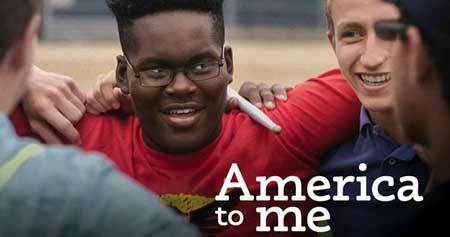 An incisive multipart documentary about implicit racism set in the Oak Park River Forest High School in suburban Chicago. I just got a small taste of this compelling series about very real but unintended racism in a high school setting at this screening and panel discussion at the Boston Public Library. Even that small taste gave a potent sense of what the rest of the series is about and I can’t wait to see the rest. Directed by Steve James, best known and for his highly regarded documentaries Hoop Dreams (1994) about African-American high school basketball players, and Life Itself (2014) about the late film critic Roger Ebert, America To Me radiates some aspects of the extended, in place, documentaries of Frederick Wiseman, and, as well, the shrewdly revelatory and often self-subverting documentaries of Errol Morris. 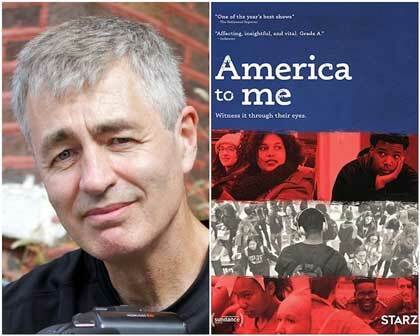 In fact, filmmaker Steve James lives in Oak Park and has decided to study things practically out his front door. As with the two excellent documentaries mentioned above both about Chicago subjects, James turns his attention close by but delivers, eloquently, a result of universal import. It’s amazing to watch how white teachers who think they are enlightened and feel they are actively showing an interest in, and feel they have the capacity to communicate with, black kids go so far off the mark. Remarkably, these teachers are aware of being filmed and say, in no uncertain terms, exactly what they mean. What’s astounding is how bad it often sounds. What black kids say in response is frequently much more reasonable and down to earth. We see an example of a wrestling coach who, with the conscious idea of teaching a kid a lesson, exhibits a somewhat sadistic satisfaction in pitting an ill-prepared black kid against a champion. His hard-boiled determination to do what he thinks is right in providing tough love just comes across as mean and narrow-minded. There are scenes of parents of black kids coming to teacher conferences with white teachers; the interactions often seem quite nice, but frequently the white teachers begin to demonstrate some degree of cluelessness. It’s heartbreaking to see how well-intentioned everyone is and how badly things turn out because of exactly what this series wants to show – that even well-meaning white teachers have a lot of implicit racism that prevents them from doing justice to their students of color. Psychological researcher Anthony Greenwald of the University of Washington has, over the past several decades, developed the idea of implicit racism and has recently offered, in conjunction with Mahzarin Banaji of Harvard University, the Implicit Association Test, a methodology that helps people become aware of their own unconscious and unrecognized forms of prejudice. It seems that taking this test might well be a useful next step for some of the teachers depicted in this incisive and compelling new television film series. The school portrayed is in an affluent and, in many ways, politically progressive, suburb of Chicago. One can hardly believe that, given that demographic, one hears what one does in this film. Imagining how much worse it must be in inner city schools which sometimes have far more extreme forms of bias leads one to despair about the prospects for rectifying this embedded cultural myopia. By bringing this shortsightedness into focus, however, the sort of study Steve James offers here provides a direct line of insight into the problem and offers hope that looking directly at it might help to envision a time when these implicit barriers to equality dissolve. With only a taste of this series, I am primed to see the whole thing, which is available on the Starz network on television and, at least in part and for a limited time, streamable online. It’s free and you can decide whether or not you want to allow your (anonymous) results to be part of the mass of collected participant data.